Scotland denied Ireland a Triple Crown with a 23-20 victory in the final game at Croke Park. Brian O'Driscoll and Tommy Bowe scored tries as Irish rugby said farewell to the home of the Gaelic Athletic Association's stadium but a well organised Scotland side were not to be denied. Scotland No.8 Johnnie Beattie struck for a well-taken first-half try and fly-half Dan Parks landed 18 points from the boot as well as claiming a third Man of the Match award of the Championship. After powering to a Grand Slam last season Declan Kidney's Ireland were aiming for more silverware before heading to their new Aviva Stadium home but their fifth Triple Crown in seven years proved to be elusive. The result handed France the northern hemisphere crown, condemned Italy to the wooden spoon and secured a happy ending to Scotland's campaign after their agonising losses to Wales and Italy and a demoralising draw with England. Scotland were splintered inside a minute as Bowe carved through a gap created by some over-eager defence but Keith Earls spilled the pass as the visitors scrambled frantically. Parks slotted the opening points after a strong response from Scotland, who waded in close to the Irish line after a handling error from Rory Best. It was from a Scottish lineout, a pillar of their campaign so far, that Ireland struck for the opener. Paul O'Connell picked off the throw and the ball was moved into midfield, where Jonathan Sexton offered his support on the loop. Scotland were flummoxed by the fly-half's movement and he broke away, finding O'Driscoll on his shoulder for a simple run-in despite the pass edging forward. Rather than exert further pressure Ireland were hit by a strong Scottish counter-attack. John Barclay offloaded from the floor to his back-row mate Kelly Brown, who found Graeme Morrison in strong support. Beattie flew up to take the final offload and the No.8 smashed through Geordan Murphy before reaching out to score a great try. Parks was unable to land the conversion but Scotland's lead remained intact as Ireland failed to combine their ambition with passing accuracy. Bowe and O'Driscoll scrapped and fought against some fired-up Scottish defence but were unable to open a telling gap. Sexton turned down a long-range shot at goal in favour of kicking to the corner but Scotland's line-out got their own back by snaffling the ball. The Leinster pivot did not turn down his next effort from distance but was unable to find the target, a mistake that Parks did not make when presented with an opportunity just before the break. Scotland deserved their advantage after some enterprising play deep in Irish territory and Parks further extended their lead with a well-struck drop-goal from the final play of the first-half. Sexton again failed to find his range with a penalty in the opening moments of the second-half and Scotland continued to outplay Ireland at the lineout. Another stolen throw allowed Sean Lamont to burst clear through midfield and while the Scottish support was slow in arriving Ireland's desire to prevent further damage on the scoreboard saw them pinged for slowing the ball down. To rub further salt into Sexton's wounds Parks made no mistake and opened up a 10-point gap. 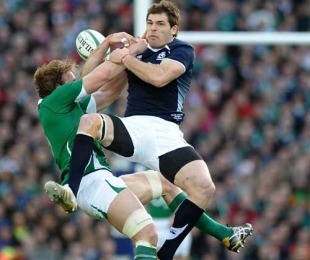 Ireland's pack secured a foothold in the game with a powerful maul that drove at the heart of Scotland's defence. Allan Jacobsen was penalised for disrupting the drive and Sexton lined up the kick despite Ronan O'Gara's attempts to get onto the field. Sexton slotted the points as O'Gara trotted into the fray for the final half-hour. A poor clearance by Hugo Southwell put the Scottish line in danger but the visitors were resolute. Ireland hammered on through the forwards before releasing Gordon D'Arcy close to the line, but Scotland's counter-ruck was again pitch-perfect to secure a turnover. Parks missed a 50-metre kick after O'Connell was called up for holding on and Scotland were made to rue the miss by Bowe. Ireland waited patiently after setting up possession on the Scottish 22, with the ball spun wide swiftly, allowing D'Arcy to draw the cover defence enough for Bowe to dart through a gap and reach out to score. O'Gara lined up the conversion from the touchline and made no mistake to level the scores. A tense stand-off between the respective front-rows, with a glowering Euan Murray to the fore, slowed the pace of the game but brought two free kicks to Scotland. The second brought a penalty and Parks was on hand as the Croke Park crowd made their feelings known. Murray, who had abandoned his scrum-cap in a fit of pique, was penalised immediately after and O'Gara showed his worth under pressure by landing a shot at goal to level the scores up once again. The pendulum had one more swing left though, and it went the way of Parks and Scotland. A brilliant kick-chase by Morrison and Nick de Luca swamped Rob Kearney and the fullback was penalised for holding on. Parks lined up the kick, taking his time, and arrowed the winning points to the disgust of the home faithful.